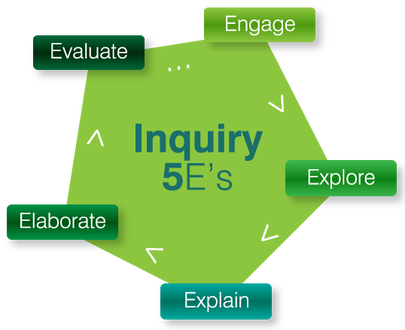 The approach used is the inquiry approach through five phases: Engage, Explore, Explain, Elaborate and Evaluate. The phases of the model are based on the 5Es instructional model (Bybee, 1997).This unit of work containing student activities assists students to raise questions, gather and process data, make conclusions and take action. Engage: The ‘Engage ’phase begins with lessons that mentally engage students with an activity or question. It captures their interest, provides an opportunity for them to express what they know about the concept or skill being developed, and helps them to make connections between what they know and the new ideas. Explore: The ‘Explore’ phase includes activities in which they can explore the concept or skill. They grapple with the problem or phenomenon and describe it in their own words. This phase allows students to acquire a common set of experiences that they can use to help each other make sense of the new concept or skill. Explain: The ‘Explain’ phase enables students to develop explanations for the phenomenon they have experienced. The significant aspect of this phase is that explanation follows experience. Elaborate: The ‘Elaborate’ phase provides opportunities for students to apply what they have learned to new situations and so develop a deeper understanding of the concept or greater use of the skill. It is important for students to discuss and compare their ideas with each other during this phase. Evaluate: The ‘Evaluate’ phase provides an opportunity for students to review and reflect on their own learning and new understanding and skills. It is also when students provide evidence for changes to their understanding, beliefs and skills. Teachers will find, as they examine this unit and its student activities that there are some learning areas which are more strongly represented than others. This is a consequence of the subject matter with which students are dealing. Naturally, sustainability is the dominant perspective, Environmental Education and Geography also features strongly in the unit as the topics deal with the planet’s condition, place and space and change. English and the Arts, particularly visual arts are featured strongly throughout the activities. Rich significant content is essential to good curriculum and a student driven exploration of climate change and actions we can take to be more sustainable is one of the significant sustainability and climate adaptation challenges a teacher can take up with his/her students. The unit includes regular reminders to invite students to check and reflect on the way their understandings, attitudes and values are evolving. In addition to reflection on content, teachers are encouraged to question students about the process they are using to come to new understandings. Deep understanding takes time – achieving it is a gradual process that evolves throughout the unit and is facilitated by reflection. This unit invites students to think beyond the data they gather and the texts they read and view – to step back from their investigations and do some big picture thinking for improved sustainability and reduced energy and/or water use, or improved waste avoidance/resource recovery and biodiversity plantings at the school. In many activities, it is suggested the teachers ‘reflect aloud’ and thereby model to students the kinds of questions, language and thinking associated with this task. Students also have the opportunity to propose new designs, processes and/ or actions to improve the sustainability of the school and reduce its energy and or water consumption; improve its waste management; improve the sustainability of transport options; grow the school’s own food; initiate a worm farm, composting system or carbon forest or improve the amount or quality of biodiversity within or outside the school grounds. An evaluation of the chosen project, design, campaign, idea and/or practice.